The Kit RBI9300T contains 68 pieces of conventional and Avionic specific test and measurement equipment for use in the aviation service field. The sturdy black polypropylene case is ideal for the service environment as it is resilient to scratches, dents and is shock resistant. The case is also airtight, waterproof, dustproof and will remain afloat should it end up in water. Temperature range is -23 to +99 degrees Celsius. Overall dimensions are 49 cm x 19 cm x 43 cm, Weight 6.1kg. 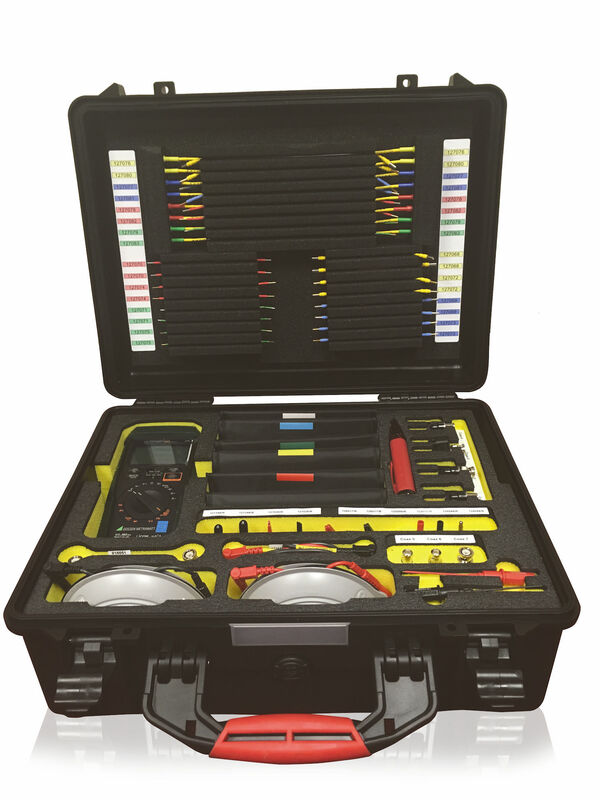 The kit contents which includes a DMM designed for avionic testing, it may also be used for insulation measurement, are contained within the case whereby each component space is labelled. GMC-I „Aero“ DMM with Power Supply , Aero Leads 22 AWG Male & Female, Aero Leads 20 AWG Male & Female, Aero Leads 16 AWG Male & Female, Aero Leads 12 AWG Male & Female, Aero Leads GTA Male & Female „NG“, Cable Extensions 6m, BNC Coaxial Adapter Kit, BNC Coaxial cable, Various Test Prods & Test Leads, 4 mm Adapter, 4 mm / 4mm Coupler, Crocodile Clips and 6 Storage Pouches for the Aero Leads. Two leads per type 4mm to male and female as well as two male to male and 2 female to female. ATA Chapter 73 Insulation test of the Fuel Control System.